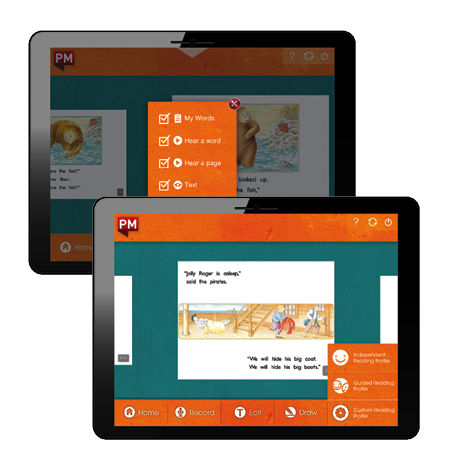 the PM eBooks – we’ve taken the proven strength of our pedagogically sound, carefully levelled PM Collection and digitised the books for use on any device. The 200 titles in the first release of PM eCollection are from PM levels 1 to 24, with another 50 eBooks from PM levels 25 to 30 to appear from February 2018.
the PM eCollection eReader is now accessable on any device. the PM eCollection Student Management Website – we’ve created a sophisticated website for teachers and administrators to easily manage students’ guided and independent reading experiences. The PM eCollection is easy to use – simply visit the Apple App Store, download the free PM eCollection app, visit pmecollection.com.au or pmecollection.co.nz to purchase a subscription for your students, and you're ready to transform guided reading in your classroom! The PM eCollection eReader app has been specifically designed for guided and independent reading. The PM eBooks visible on each student’s bookshelf in the PM eCollection eReader app can be managed by teachers and administrators. The eBooks are displayed on the bookshelf and are ordered by PM colour and PM level. The reading-session boxes at the top of the bookshelf are organised by teachers and administrators using the PM eCollection website. A reading session may include one or more PM eBooks set to the Guided or Independent Reading profile. PM eBooks may be assigned to a single student, multiple students or reading groups. The reading session may also include a note from the teacher. The intuitive controls and navigation are perfectly suited to today’s digital learners. The gestures used for choosing and reading eBooks in the PM eCollection are already well known by today’s students. The ability for students and teachers to choose a reading profile – guided, independent or custom – enables the reading experience to be tailored to the needs of learners in specific situations. The Guided Reading profile disables the audio and record functionality so that distractions are minimised. The Independent Reading profile enables the audio and record functionality, offering full support for students reading on their own. The Custom Reading profile allows the user to enable or disable the My Words and audio functionality. Users can also use the Custom Reading profile to show/hide the text, instantly creating opportunities for retelling, innovations on the text and other oral literacy activities. Each PM eCollection eBook has been completely redesigned for compatibility with any device, to optimise the reading experience of learners in the digital age. The PM eCollection has the same scaffolded support and pedagogical underpinnings as the original PM Collection, including exact text-to-image matching, careful consideration of text size, font and line length, meticulous levelling and developmentally appropriate storylines. Download a list of the 250 PM eBooks currently comprising the PM eCollection. ability for students to draw and add notes to PM eBooks. website to manage the PM eBooks and teachers included in their PM eCollection subscription. specify when the session no longer appears on the student’s bookshelf. a graph showing progress over time the student’s reading history.